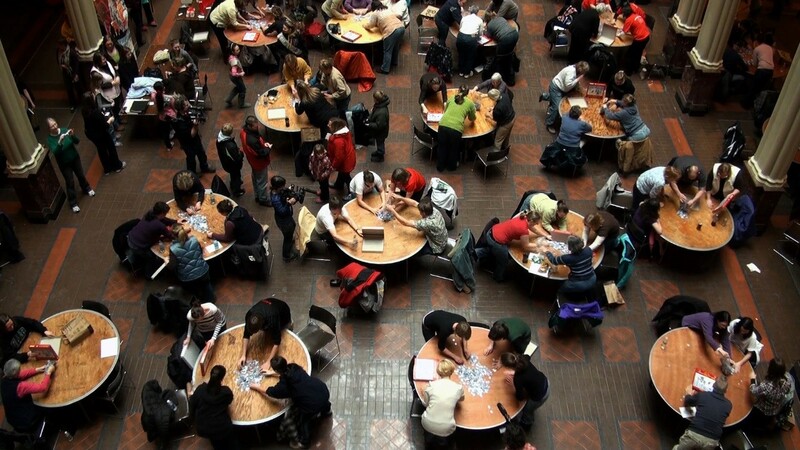 Have you ever thought about hosting a jigsaw puzzle competition in your town? A puzzle competition can be great event used to host a fundraising event or simply just to bring your community together for some fun. If you’re wondering what a jigsaw puzzle competition is and what tools you need to hold one of your own, look no further! We’ve got some useful information and hosting tips for you right here. What is a Jigsaw Puzzle Competition, Exactly? Some planning and organization will be required for your event to take place. You’ll need to determine where you will host the event and how to make people aware of your event, too! A venue is a must for your event, especially if you’re expecting a large turnout. Research areas in your city that offer rental space for events. Click here to find event spaces near you. Some venues may include this with their rental space. If they do not, you will need to consider renting tables and chairs for the event. Competitions tables should all be the same size. Find table rental locations near you. The most needed item for your event are puzzles, of course! You will need to determine how many puzzles you will need. How many individuals or teams do you plan to have participate in your competition? Remember, all the jigsaw puzzles for each round must be the same for each participant so that it is a fair challenge. You certainly could purchase all the puzzles, but there are likely many puzzle companies or local stores in your area that would be happy to donate puzzles for your event if you list them as a sponsor or provide at a discount. You will need two moderators to help observe and record events. This is an important role, as they will be ensuring that competition rules are being followed, answering any questions participants have, timing the rounds, recording finish times, and more! Prizes for the winning individual or team along with 2nd and 3rd place winners are a great thing to have. Reach out to local businesses for sponsorship and donations. This way, you won’t have to foot the bill on the prizes – unless you want to, of course! For any competitions success, you need participants! Advertise your event with the community – create flyers, post on social media, and advertise in your local paper. Make the community aware of your event! You will also need to create some sort of registration process to track your number of participants to ensure you will have enough space for everyone at the competition. You can charge for registration or it can be completely free! The Alzheimer’s Association – Cleveland Area Chapter decided to host a puzzle competition and wine-tasting, cleverly titled, “Puzzles & Pinot” as a fundraiser and it was a great success! Jigsaw puzzles were the perfect fundraising activity for their cause, particularly with Springbok puzzles and the Puzzles to Remember Alzheimer’s line of puzzles. For the competition, they opted for Springbok’s Seaside Cafe 500 Piece Jigsaw Puzzle. This piece count was the perfect amount for a medium-difficulty puzzle that would take 1-2 hours to complete. The first-place winner was an avid puzzler who is working on breaking the Guinness Book of World Records for the most puzzles completed. The Alzheimer’s Association successfully raised awareness about Alzheimer’s while also raising over $1,600 for their organization.